Dorothy Gale, on a voyage at sea, is tossed overboard during a storm. She is washed ashore at Ev, a country neighboring Oz, where she meets up with her old friends the Scarecrow, the Tin Man, and the Cowardly Lion, and meets Ozma, the new Princess of Oz. The book itself is, of course, a classic. I love L Frank Baum and grew up reading all the Oz Books, and this was certainly one of my favorites. Decades later I simply wanted to read it again -- but, no, actually, this time, listen to it. Although I was a voracious reader as a kid, I now unfortunately am a slave to the digital age and don't read books at all anymore, even Kindle, but instead now enjoy audiobooks, especially when I'm driving or when I'm walking my dog. It hadn't occurred to me before that there would be all the Oz Books done as audiobooks and, more than that, that there would be so many versions to choose from! But there they were and I needed to choose. For me, you can have the best-written book; but, if the narrator isn't cast right, it can get tedious fast. It also works conversely -- great narrator, bad material, no good. Well, I already knew Ozma Of Oz was a great book -- so I just needed to "audition" the narrator. 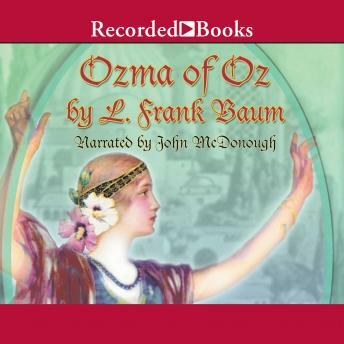 I perused over more than dozen audiobook versions of Ozma Of Oz, here and on a few other sites, and was so excited when I found John McDonough. What a terrific reader, narrator, voiceover artist! He has just the most warm and comforting voice and, when appropriate, commanding! He "gets" the material, makes all the exposition so joyous to listen to, and makes the lines the characters are saying (the acting!) come to life! I commend Mr. McDonough, who has a natural talent and ability, but also makes great choices in his narration. If you were looking to find the best narrator for this book -- THIS is the one! I just wish he had done ALL the Oz books, he has only done a few, and I have to sift through countless audio to find the best narrators for the other Oz books -- not an easy task.